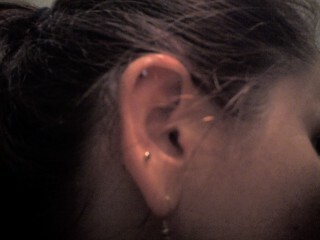 Treated myself to new cartilige piercing (top sparkler) - sorry Mum! Done by our new friend Stuart who is a pro body piercer. So far a bit ouchy at bedtime but all good. I am a hygiene nut as you all know. one thing i recommend though - as soon as you can, change it for a hoop type earring. i find them a lot easier to sleep with & don’t get caught in sweaters & bags & hair & stuff. The one I have has a flat back as it is internally threaded so it sits flush against the back of my ear. It is not digging into my head as I sleep as it would with a ball or a *gasp* butterfly ear-ring back. It is only ouchy at night if I sleep on it as the ear itself is sore. BTW I have a lovely catalogue of yum sparklers at the moment. Am going to make an order if you want to have a look and get some new ones for yourself. there are some amazing styles. But day 3 and still all is well. Nothing gross happening at all. But I am being a clean girl and resisting the temptation to play with it with unwashed hands. Now that I think of it, lobe is a very odd word. ooh…sparklers? always interested in sparklers. and think i’ll be putting an appearance in at araku tonight….woohoo! YAY - I will be there!! From 8pm. What??? Nobody invited me? LOL. Just kidding. Work was busy tonight. Glad to hear it Keep up the good work. I will have to agree with you to an extent. That is recommend for some piercings, some of which I will not pierce with anything except a captive bead ring(hoop type earing) and after the intial healing process then it can be changed. As for the goddess’s ear, the placement of a flat back stud is very helpful in the healing process. Also the fact that it is internally threaded, this eliminates the possibility of anything getting caught on it. You have to pay a little more attention to it however, it will heal quicker than a captive bead ring. With the captive bead ring, when you lay down or put any pressure or accidentally bump it, because of the angle of the CBR and the forced leverage it puts on the pierceing can be very damaging and not to mention painful. Where as the flat back, if bumped, slept on or what have you, will simply slide from one side to the other. Especially good when sleeping when most damage can occure. My mother would never let me get that when I was a kid. I grew up and decided I could have what the hell I wanted. My mother was right. It hurts too bad to get it pierced there! It’s funny now I tell my daughter the same thing.